FC Wisconsin was delighted to announce the hiring of former Premier League footballer Neil Tolson in June. Neil has already been able to positively impact so many FC players in such a short space of time with the club. Below is an interview with Neil to help all our players and families to better get to know him as a former player, coach, and what he enjoys about the coaching process. Briefly tell us about your soccer career and your pathway to playing at the highest professional level in England? I started playing junior academy football when I was seven. I was then spotted at age 11 and played in the youth set ups at West Bromwich Albion, Stoke City and Leicester City, before signing with Aston Villa. At 16, I suffered my first set back in football when I was told by Villa that I was not good enough and was released. I then joined Walsall where I signed a two year contract. Two years from being released, I became, at the time, one of the most expensive teenage signings in English football when I moved from Walsall to Oldham Athletic for £250,000. I went on to play and make my Premier League debut at 18 against Chelsea at Stamford Bridge in a 1-1 draw on the opening day of the 1992-1993 season. I spent two years at Oldham before moving to Bradford City for £175,000 where I scored over 30 goals in two and half seasons. We also went on to gain promotion at Wembley in the 1996 playoff final against Notts County. In 1996, I decided to leave Bradford and signed for York City where I teamed up with Alan Little, who I still aspire to be like, for the first time as manager and coach. I scored 17 goals in my first season and 15 over the next two, but this was the start of my injury problems. After Alan Little left York, he became the manager at Southend United and I was delighted to join him there. Again, I started the season very well and scored 13 goals before the Christmas period. Unfortunately, injury after injury took over and I was unable to play professionally anymore. I had numerous operations to rectify the problems but with no joy, and I still have a metal plate holding my pelvis together now. I did manage to play non-league football notably for Hyde United where we gained promotion twice and I tallied up nearly 100 goals in five years before going into coaching and management. My first professional game was in the FA cup for Walsall away at Yeovil Town when I was 17 years old. My first goal was against Yeovil on my debut. We drew 1-1. Best player you have ever played with? Biggest crowd you have played in front of? Best stadium you have played at? Biggest influences on your career? I would say my family, as I wanted to follow in my Granddad’s footsteps and play for England. Best manager you played for? Joe Royle at Oldham, who later went on to manage Everton and Manchester City, and Alan Little at York City and Southend. Best career moment in football? From a coaching standpoint it would have to be when coaching Altrincham in the playoff final. We made a 120th minute substitution, who went on and scored within 10 seconds to win the game 2-1. From a playing perspective scoring the winner against Everton in the FA Cup for York City in a 3-2 win. What is your coaching background? I started coaching quite young while I was still a player and would help out in the youth teams and academies on an evening. Once I stopped playing, it was the next step. Although I enjoy the stress of first team football, I also enjoy developing young players and seeing their careers move forward. For example, I was able to coach and help in the development of Duncan Watmore who has gone from Altrincham youth team to represent England U21’s and play Premier League football with Sunderland. What brought you to FC Wisconsin? My friend from school who was a fantastic footballer who now lives in Texas is a good friend with Billy Solberg and he recommended me to FC Wisconsin and visa versa. After speaking with both Ben Shepherd and Billy Solberg extensively over a couple of months, I could see that their passion and desire to develop both the player and the person fit with my aspirations. What would you say is your coaching style and best attributes as a coach? 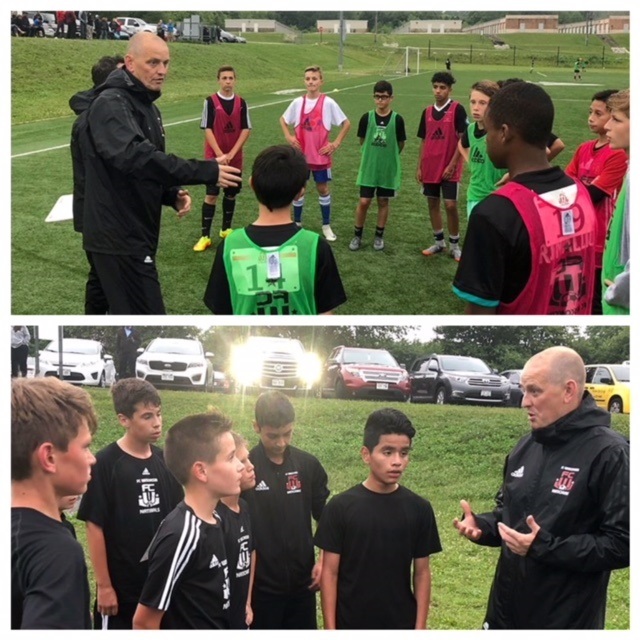 My style of coaching will be lots encouragement, lots of instruction,s and giving players the opportunities to express their abilities to improve. I will give everything to the team and club, so I expect the players to give the same back. I can adapt to any situation, which I believe is key in coaching if you are going to relate to players. My strength will be my man management skills and being able to motivate individuals and a team in general. What are your initial thoughts of FC Wisconsin, the players and the club in general? On the pitch and at training I’ve been really impressed with the technical level that the players have and their willingness to learn and work hard to become better players. I think tactically we can learn the game a little better, but that will come with more coaching. Off the pitch, the people I’ve met have been so friendly helpful and generous and have made me feel really welcome. It definitely has that family feel to it. I’m excited for the future! Biggest advice you would give any aspiring young player? My one piece of advice would be to never give in, keep working hard and believe in your goals because they are reachable. As you can see in my early career I had to suffer setbacks, and rejection from clubs. This was just all part of my journey to becoming a professional footballer. The key is to continue to work hard and remain positive even through difficult times.